This feature provides an ongoing "myth-busting" Weblog designed to expose, reality-check, and correct current and prevalent misconceptions, misunderstandings, deceptions, "Old Wives' Tales", fairytales, and various and sundry other myths relating to public transport and rail transit. 31 May 2007: "Free" buses vs. "expensive" rail? There seems to be a widely held notion among the public – including many politicians, journalists, etc. – that rail transit systems, such as light rail transit (LRT), are weighted down with substantial heavy capital expense, while buses are more or less "free". Rail transit critics exploit this misconception by emphasizing the relatively high installation costs of new rail systems ("BILLION$$$ for rail") vs. the relatively lower costs of simply operating buses on city streets and freeways. "Why build expensive rail? Buses can do the same thing cheaper" is a familiar refrain in local debates over proposed new rail transit starts. Bus systems incur sizable capital expenses, too, as well as rail, with typically much higher operating and maintenance (O&M) costs; often, when you add up all these costs and account for the relative life of all the infrastructure and rolling stock, plus the work performed (measured in passenger-mileage or passenger-km), you may find that rail actually gives amazing "bang for the buck". To demonstrate this, the Light Rail Now Project team carried out an analysis of transit performance data from St. Louis Metro, comparing the total operating and maintenance (O&M) plus capital costs of both Metro's bus transit and MetroLink light rail transit (LRT) systems for the period 1996-2005, using National Transit Database Agency Profile data gathered by the Federal Transit Administration. It is particularly interesting to note that, even with its heavy capital costs, when operational costs are considered, St. Louis Metro's LRT in this period exhibits total costs slightly less than the agency's bus operations. However, higher total passenger-mileage was carried on the bus system, so a more complete analysis would require taking into consideration the differing life-cycle costs for each mode (e.g., railcars last considerably longer than motor buses) by annualizing capital costs. To obtain a total annualized cost figure for each mode, capital costs were annualized using common economic analysis (see discussion below). Annual operating costs were averaged for the 10-year period, as was annual passenger-mileage for each mode – reflecting the advantages of the longer lives of both LRT infrastructure and rolling stock. For bus, average annual O&M costs were $104.6 million, and average passenger-mileage was 139.0 million. For LRT, average annual O&M costs were $26.2 million, and average passenger-mileage was 104.8 million. This suggests that, with total capital and operational costs considered, St. Louis's "capital-intensive" LRT ends up costing approximately 16% less per passenger mile than the agency's supposedly "cheap" bus system. Through this method (which adjusts somewhat for more recent inflationary increases), LRT still comes out about 15% less than bus service In terms of work performed (i.e., passenger-miles carried). The assumptions used for annualizing capital costs depart significantly from those required by FTA (after all, this is a form of benefit-cost analysis, not an exercise in meeting FTA's New Start project qualification benchmarks). Thus, an annualization (discount) factor of 5% was used, rather than the 7% mandated by FTA – given today's interest and inflation rates, it is difficult to justify anything above about 5% for a public works investment. In this assessment, a 50-year life is assumed to be reasonable for LRT infrastructure because this includes right-of-way (ROW), to which even FTA assigns a 100-year life. FTA's mandatory life expectancy for railcars is 25 years, which seems unreasonably low compared with industry experience. Various sources report a 30 to 35-year economic life for rail rolling stock; this analysis has used 30 years. The FTA's average life for a bus of 12 years, on the other hand, does seem reasonable in light of widespread industry experience, and this is corroborated by reliable documentary evidence. For the economic life of bus fixed facilities, 45 years has been used for several reasons: (1) Buses run mainly on public streets, so there's very little need for ROW acquisition and cost. (2) Many bus facilities, such as sidewalk signage, benches, etc., are much less durable than comparable items on rail stop or station platforms. (3) Bus pavement has a shorter life than rail track infrastructure, and their salvage value is basically nil. Bottom Line of this analysis: At least in the case of St. Louis Metro's bus and rail operations, examination of actual total capital and O&M costs over a ten-year period suggest that investment in LRT has lowered the total unit cost of providing public transport mobility. And this simply accounts for direct agency costs, without consideration of the array of significant additional benefits of rail service for passengers and the community. 23 March 2006: Transit fares out of control? Transit fares have increased much faster than the rate of inflation, demonstrating one of the evils of public ownership of urban transit – the inability to keep the cost of operations under control. This argument is promulgated by a number of prominent transit critics, such as Charles Lave. However, says transit researcher Leroy W. Demery, Jr., it is refuted by a comparison of current fare data vs. historical data. during the era of the five-cent fare, historic data make clear that the "typical" average travel distance was in the range of 2 - 2.5 miles. Thus, the "average" fare paid fell into the range of 2 - 2.5 cents per mile. That works out to $0.40 - $0.50 per mile in today's dollars. Thus, fares in constant, inflation-adjusted dollars are actually about 40-50% of what they were in much earlier times – certainly not higher. So why have fares dropped so steeply since that older era? "I can think of a number of transit systems and lines that would return an operating surplus" observes Leroy, " if it were possible to collect fares at this level today – which it isn't, because of auto competition." 6 February 2006: "BRT" cheaper than LRT? "Bus Rapid Transit" ("BRT") is much cheaper than light rail transit (LRT). Transportation engineer Edson L. Tennyson, PE (a technical consultant to the Light Rail Now Project) has analyzed this issue extensively, and contends that the "cost savings" of high-quality, equivalently routed "BRT" – compared with LRT – are largely imaginary. Ed notes that Denver's C and D LRT lines, Portland's MAX LRT to the PDX Airport, Salt Lake City's Trax LRT to Sandy, and St. Louis the MetroLink LRT extension from East St.Louis to Scott Air Force Base – a total of about 45 miles of LRT in all – cost approximately $23 million a mile "including cars and some shops". Phoenix's new LRT, presently under construction almost entirely in the street, "is costing more than twice that with five years of inflation (15% total) and much street reconfiguration." Ed assigns LRT a rate of 3.0 percent depreciation, "so the annual cost of $23 million is $700,000." In contrast, Ed points out, Pittsburgh's West Busway, built at generally the same time as the above LRT lines, cost approximately $50 millon per mile without the cost of buses included – although it had a tunnel rehab involved. However, the busway also benefited from a pre-graded right-of-way from a former railroad. No buses or garages were included in the cost. The Harbor Freeway Transitway (busway) in Los Angeles also cost approximately $50 million per mile, with less pavement cost for HOV construction but higher station costs in the freeway. Ed figures that, with shorter bus and pavement life, the depreciation rate is 5% – so the annual cost, with the cost of buses included, is $3.5 million per mile ... "far in excess of LRT cost. " in fact, Ed emphasizes, "Five times as much." While LA's "Orange Line" busway cost only about $14 million per mile, plus the cost of buses and their facilities, Ed contends that "that low cost is not honest." He points out that the right-of-way was previously acquired for LRT (but political problems stemming from local community opposition resulted in legislation prohibiting the installation of a surface LRT line in the corridor). Ed adds 25 percent to the project cost for the right-of-way, and adds in the cost of the buses, bringing the annual depreciation to about $1.4 million per mile, "double LRT cost." Then, Ed notes, annual operating cost must be considered. Unfortunately, Ed points out, "There is no real world operating data on a Busway. It is buried in system averages. If we use such averages, buses cost 80 cents per passenger-mile. Hopeless." More on "Bus Rapid Transit"
Buses can run on steep grades, but light rail cars are limited to grades of 6%. Rubber-tired vehicles such as buses have incrementally better traction on dry pavement, but significantly lower traction in wet, icy, or snowy conditions. 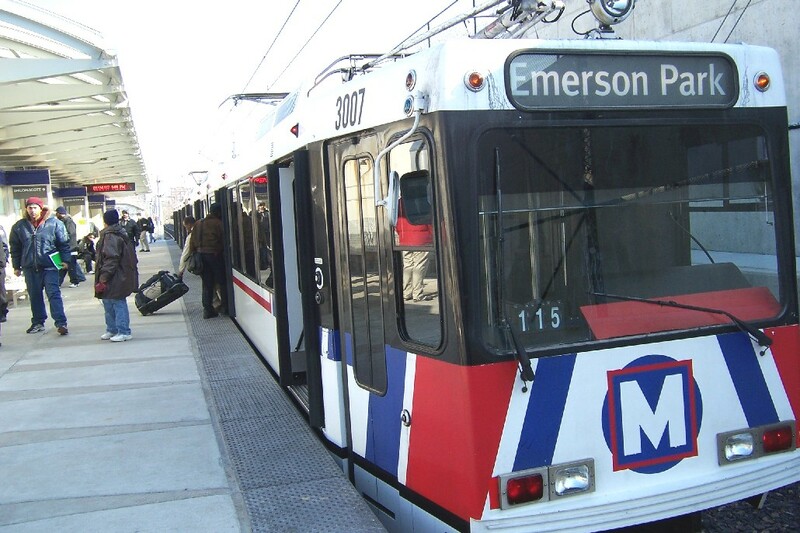 Furthermore, electric light rail transit (LRT) railcars – including streetcars (trams) – are capable of negotiating much steeper grades than is commonly assumed and included in system designs. · Sheffield – short section on 10% grade, and others at 9%. Articulated tramcars operate without any problem on these grades, on a daily basis. All axles on the cars are powered to enable operation on such gradients. · Würzburg – operation on approximately 10.8% grade. · Nordhausen – the tramway, located in this small city on the south side of the Harz hills range, negotiates a 9.8% grade in Stolberger Strasse for about 500 meters. · Remscheid (system now closed) – 10.9%. · Boston – C-Commonwealth Avenue streetcar line has a gradient of more than 8%. Historically, some American electric surface railway lines negotiated even steeper gradients. For example, transportation engineer and transit industry veteran Edson L. Tennyson, PE (a technical consultant to the Light Rail Now Project) recounts that Pittsburgh's Route 21-Fineview streetcar line had 12 percent grades. Ed, who notes that he worked for Pittsburgh's transit company between1947-1949, emphasizes that – despite Pittsburgh's somewhat daunting climate conditions – the Route 21 streetcar "ran if anything else ran." 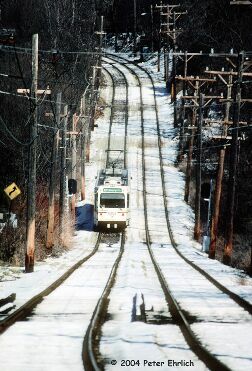 Pittsburgh's LRT system routinely negotiates numerous steep grades, such as in this winter scene on the Library line near the Highland station. As a general rule, routinely designing systems with very steep gradients should be avoided, to benefit longterm ongoing operations. Within reason, however, the longitudinal slope can be increased when the situation demands. Stations on steep slopes require special design considerations. A 5% gradient (1:20) approaches the steepest it is advisable to plan for without special provisions on the platform (such as railings for the mobility-impaired). A 1:12 ratio (8.3%) is the maximum allowed by the Americans With Disabilities Act (ADA) for a ramp. The problem is that buses lose adhesion in winter weather and even heavy condensation weather, which does not wash the film of oil slick off the pavement. While buses may spin going up hill, they may just not stop going down. Some rail lines on steep grades had derail switch points to stop a car exceeding safe speed. With electronics, a speed control device might do the same if the brakes are warm. Dynamic brakes with disc shoes are not safe in very cold, fine, dry snow. Ice forms on all of the vital parts. Magnetic rail brakes will help if the rail is treated with slip retardant. Buses have many other undesirable qualities. ... [For example] Ride quality and safety are lower. Noise and pollution are offensive. Hill climbing power of buses is inferior. Light rail cars last only about 25 years. Light rail transit (LRT) railcars have an average economic life in the range of 30-40 years. With midlife rehabilitation, some railcars 60 years old, and older, continue to operate in daily service (e.g., San Francisco, Kenosha). The Perley Thomas heritage streetcars still operating in New Orleans are more than 80 years old. There are plenty of examples with more modern vehicles. For example, the orginal U2 LRT trams in Frankfurt/Main, Germany, which began operating in 1968, are still going strong after 38 years of service.